What it is: A dual formula that contains Photo Finish Foundation Primer and Artificial Light. 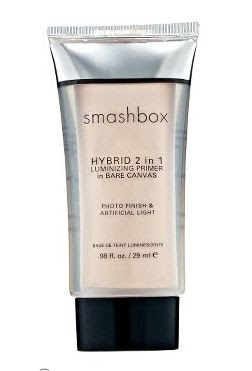 What it does: Smashbox Hybrid 2 in 1 Luminizing Primer creates a smooth and glowing canvas for a flawless makeup application. This revolutionary formula combines the power of two products: Photo Finish Foundation Primer and Artificial Light. You can wear it under foundation or alone for a vitamin-packed, natural glow. i'm a sucker for primers and just recently, anything illuminizing. oh please advise if this is available here already. i would love, love to have this! I just went to Beauty Bar in Trinoma. Never saw this pa.